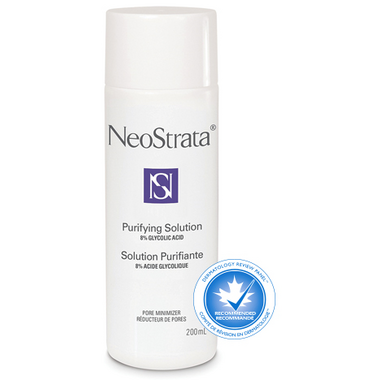 NeoStrata Purifying Solution applied on acne-prone skin areas, this solution reveals clearer skin without over-drying. For severe acne-prone skin, this solution can be compounded to achieve optimal results. Directions: Cleanse skin before applying the product. Apply product to affected areas with a cotton pad 1 or 2 times daily. First time users should build skin tolerance gradually. Prior to sun exposure, use sunscreen on areas treated with AHAs. Cautions: Use only as directed. Contact of the product with the skin must be of limited frequency and duration. For external use only. Avoid contact with eyes. If irritation occurs, discontinue use and consult a physician. Keep out of reach of children. I started using this product 3 years ago and it has done wonders for my skin. It can be a drying if you don't use moisturizer after application. It has helped with fading of scars and uneven skin tone. MUST wear sun protection or skin will burn very easily (I use a daily moisturizer with SPF and it does the trick) . I highly recommend this product. This product or your skin will burn! Most toners are just pleasant water but this has AHA's and I find it actually helps my skin. I don't use it for acne - glycolic acid is also useful for aging skin concerns eg uneven skin tone.